At Meneage Dental, our aim is to put a smile on your face that you can be proud of. Based in the heart of Helston, we’ve been providing expert dental care for over 35 years to patients across Cornwall – and even beyond. Our patients are like part of the family, with many of them growing up with us since we first opened. And it’s the same with our staff! Under practice partners Paul and Scott, and our practice manager Sarah, many of the team have been with us for a decade or more. When you come for an appointment, you’ll know exactly who you’re going to be seen by and that they’ve got your well-being front of mind. Meneage Dental has numerous UK dentistry accreditations. With our superb team of dentists, hygienists and dental nurses regularly training in the latest techniques and technologies, we’re always looking to make sure the services we provide are nothing short of excellent. 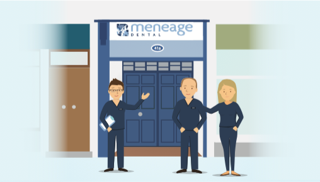 Meneage Dental in Helston, Cornwall – modern dentistry with good old-fashioned courtesy and concern. Updated in 2018 – our Data Protection Privacy Notice for Patients. Website design and marketing by 8X Cornwall UK.